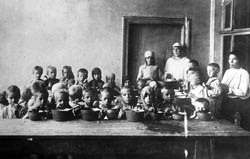 Tatar nationalists have appealed to the United Nations to recognize the 1921-22 famine in the Middle Volga as a genocide organized by Bolshevik Russia to destroy the Tatar nation and its elite and reduce Tatarstan’s opportunities to develop its own national life and pursue its independence. Rafiz Kashapov, who heads the All-Russian Tatar Social Center (VTOTs) in Naberezhnye Chelny and has long been pursued by Russian officials for his activities, says what Moscow did to the Tatars helped Moscow prepare “the terror famine” against the Ukainians (mariuver.wordpress.com/2008/11/05/golod-genocid/). The efforts of Kashapov and his colleagues to prove their case regarding the famine in the early 1920 are unlikely to be successful. There is simply too much evidence that the famine at that time was the result of disorganization and bad weather than official action (On this, see www.irex.ru/publications/polemika/6/sanukov-rus.htm). But his and their statements in this regard are nonetheless important both as an effort to expand Tatar ties with Ukrainians and with the active Ukrainian diaspora and as a means of attracting attention to the increasingly tight Russian control of the media in Tatarstan. Three days ago, Kashapov gave his first interview to a Ukrainian outlet, pointing out that he had given numerous interviews to American, Japanese, Turkish and European journalists but that now Ukrainian media were ever more important for the Tatars (www.rupor.info/fokus/2008/11/03/nezavisimost-tatarstana-umiraet-v-sizo/). All “other outlets of the mass media,” he said, “are under the tight control of the FSB.” And because of that and because of the increasing persecution of Tatars and Tatar nationalist activists like himself, Kashapov said, even VTOTs is significantly less active than it was a decade ago. Moscow, he continued, has prohibited the opening of a Tatar national univiersity, it has prevented the Tatars from shifting their language to a Latin-based script, and it has closed numerous Tatar schools, newspapers, radio stations and journals, actions that have struck at the heart of the nation. But recently there have been some encouraging signs of a rebirth of Tatar nationalism, Kashapov indicated, and one of the ways to help that process along is for the Tatars to link up with other nations, like the Ukrainians, who have also been victims in the past of Moscow’s imperial and genocidal policies. Thus, although the Tatar appeal to the United Nations is not going to succeed in the narrow juridical sense, it has the potential to create Moscow’s worst nightmare – the linking up of various non-Russian groups who have often focused only on their own problems rather on their common victimhood. And if the Ukrainians respond to Kashapov’s efforts, then there is a possibility that the synergy between the two nations and the two national movements will be far more influential on the future course of events than any declaratin however worded by the United Nations or other international body.